The world knows no bigger denier than the chronic snorter. Anytime you bring up their sleep disturbing condition, you're faced with rejection or indifference, and there's seemingly no end to the problem. There's still something else you can try, though. What if you produced convincing, bulletproof evidence of the sawmill-like sonic awfulness hailing from their obstructed airways? Surely then they will be alerted to the horridness of their ways and motivated to resolve these most unpleasant matters. Okay, the latter may be wishful thinking on our part, but even if so, there is an app that lets you record serial snorers — you included — and surprise them with the evidence. It's called Sleep Talk Recorder and runs on Android and iOS devices. You open the app on your smartphone, place it in close proximity to the snore emitter, and activate the recording. So, how does that differ from any old sound recorder app, you say? Well, STR is specially equipped for the task, as it features an activation delay that lets it automatically start recording after a set amount of time, along with a filter to purge inaudible recordings. You can also adjust the microphone's sensitivity, capturing the subtlest of snores, or avoiding overloading the mic with the gnarliest snore outbursts one can unconsciously muster. Most amusingly, your recordings can be arranged into collections of your favorite snore "tracks" and uploaded to a global community of users just like you. Their recordings are ranked based on upvotes, and curated in collections - say, funniest, or random. What can we say, some people really don't have anything better to do with their time, and we're here to reap the benefit! 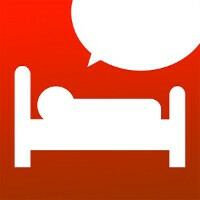 Sleep Talk Recorder is available on Android and iOS. It's free to use, but there are in-app purchases. You can listen to around two hours of recording before you have to pay. And then you can either pay up, or release the tracks as a performance art album. You will make mama proud! Nov 23, 2015, 7:29 AM, by Luis D.
Jun 16, 2015, 11:05 PM, by Florin T.
Feb 07, 2014, 8:23 AM, by Chris P.
May 21, 2015, 4:05 AM, by Chris P.
Nice app for where a group of friends stay.